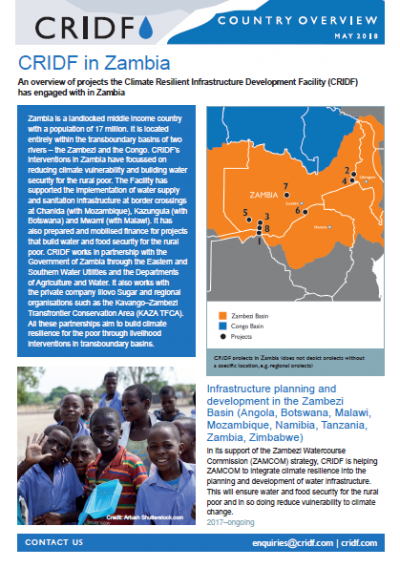 This brief gives an overview of projects CRIDF has engaged with in Zambia, with particular focus on the impacts of the projects for basin communities. CRIDF works in partnership with the Government of Zambia through the Eastern and Southern Water Utilities and the Departments of Agriculture and Water. It also works with the private company Illovo Sugar and regional organisations such as the Kavango–Zambezi Transfrontier Conservation Area (KAZA TFCA). All these partnerships aim to build climate resilience for the poor through livelihood interventions in transboundary basins.